Recently I have finally upgraded to Windows Vista from Windows XP. Except regular trouble of upgrading your operation system that feels like moving to a new house (which is people say worse then an earthquake and flooding together) I was quite frustrated by a number of annoying problems with IIS 7 when first it's not installed by default (all right, security is tougher now, but can I at least have an option? ), then not all of the components installed that required by ASP.NET and VS2008 (is it so difficult to suggest a correct package? ), then again my web app does not work with the default App Domain (why did you guys call it "default" and the real default call "classic"? ), and finally everything works but the site does not look like it should be. I spent some time probing different setting of IIS and finally gave up and looked it up on the Internet. What a relief! It's a Microsoft bug and not me being an idiot! Actually it was submitted on March 17, 2007 and still not in SP1. So the problem was that the entire static content of the web app including images and styles was not returning to a browser by IIS (content length 0 bytes) because IIS 7 initial configuration was incorrect when it was first installed on Vista. Once again - out of the main topic, but I can't be silent, can I? So I was straggling with myself over understanding what party should I vote for. The challenge was that it's not easy to figure out their election platforms. They do make a lot of noise but when it actually comes to statements there is somehow magically not so much to hear. Who are you talking to, guys? Can't you just drop your theatrical games and speak clearly of what you are about to do? Of course there are public images that could help making a choice: liberals are "thieves", conservatives are too easily "sold" to private interest groups, bloc are "nationalists", green are "blah" and NDP are "don't know who exactly". But still the statements are much easier to analyze for a thinking person. Luckily there is this very helpful web page called "Party Game" on thestar.com that shows the positions of all the parties on the main 8 problems. You take a quiz where you select your choice of a solution for each problem and at the end you see which party aligns the best with your own platform. Very helpful and surprising! Now I almost know who I will be voting for. 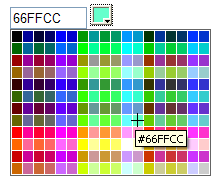 I have published an article on Code Project about the Color Picker ASP.NET AJAX Extender. Please read it there. Many of ASP.NET server controls base their internal HTML rendering algorithms on the values of their properties. Developers are mostly aware of those properties (not always about their roles in the internal rendering process though) but don't always realize the importance of the default values. From my experience there is a common assumption that if a property appears empty in the Visual Studio property window that means the default value is empty. Not always true and can be harmful for the output HTML content! Luckily there is always a way to ensure the default values of the properties in ASP.NET markup (.aspx, .ascx). Here are a few examples. It has a string property SkipLinkText that by default appears empty in the property window. But in reality if it's not set it's populated from the embedded resource string. That effectively leads to a difference in HTML rendering that does render an img tag inside the breadcrumb path with the height and width attributes set to 0 (don't ask me why!). Some browsers react inadequately on such the HTML if some CSS styling applied to the breadcrumb content. For instance IE6 does not honor a line-height attribute if there is an in line image inside the paragraph. So to ensure that unnecessary HTML is not rendered in this case always use SkipLinkText="". It has a string property ForeColor that defines the color of the text appearing in the control and is prepopulated with the Red value. Having a value in this property effectively leads to the control rendering out an inline styling "color:Red;". But if you want to define a text color in the CSS class that you apply to the control you have to explicitly set this property to empty value ForeColor="" otherwise it will always render out the inline styling which will effectively override your CSS settings. This is quite a complex and sophisticated template-based control that comes with ASP.NET Membership framework. From the first sight you assume some degree of intelligence built into the control based on its complexity. For instance, that it does validate user input and render error messages if something is wrong. And it's true except that it does not validate e-mail address string against a regular expression unless a property EmailRegularExpression is set to a proper value and it is not by default. Also it does not provide a developer with such an expression even though it is built into a standard RegularExpressionValidator control. So be careful and don't forget to set this property EmailRegularExpression="\w+([-+.']\w+)*@\w+([-.]\w+)*\.\w+([-. ]\w+)*" otherwise you will be surprised that a user can enter some garbage into the e-mail field and is not stopped doing that. So above there are just some examples illustrating an importance of paying attention to such details as default values of the server controls' properties. I am sure you can find more examples based on your own experience.